If your heat goes out, your electricity doesn't work or the pipes are leaking, do you know what to do? For homeowners the answer is to fix it. But for renters sometimes it's unclear. The I-Team gets calls all the time from people who feel their landlords aren't keeping up their properties the way they should. We learned that as long as you're paying your rent, the city can help you get your complaints solved faster. Rachel Mahuta let the I-Team into her apartment on N. Marshall St. in Milwaukee to see some of the issues she's reported to her building. One of the lights in the bathroom just doesn't turn on anymore," she said. "They cut a huge hole into the wall, and just never bothered to fix it up again." Mahuta showed the I-Team emails she sent to the building's owner, Katz Properties. She said sometimes maintenance comes in a day or two. The Company tells the I-Team 24 to 48 hours is their standard. Mahuta said that's not always what happens, even when she reaches out with safety concerns. She's called about unchecked smoke detectors, broken outdoor lights and the entrance door not locking. "Calls like that just go unanswered," she said. "I'm more just nervous about my own health and safety." What Mahuta didn't do right away is to go to the City. "I've been a little concerned we'd get evicted if we complained too much," she said. "That's a serious worry," said Mario Hernandez from the Department of Neighborhood Services. Hernandez said that common concern shouldn't stop you from making a complaint. The City can cite a landlord if they try to get back at you. "If the tenant is making a good faith complaint and they're abiding by the rental agreement, this department has an obligation to go ahead and protect them from retaliation," he said. Hernandez wasn't familiar with Mahuta's complaints, but said the City needs one to help people. "They're actually paying for a property to live. They want it to be safe, inhabitable and they're not getting what they pay for," he said. And that's the key. You still have to pay your rent. 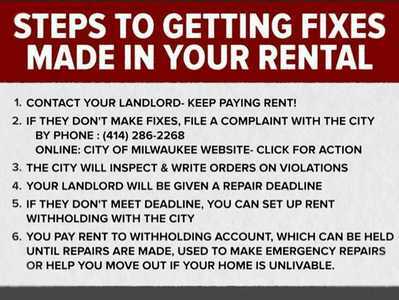 But, if your landlord isn't making fixes ordered by the City, they don't have to get your monthly check. "Rent withholding an account is set up by the tenant. They can go ahead and pay the money to the City rent withholding program," Hernandez said. He said the City keeps the money until repairs are made or they use it to make emergency repairs. If they find the property isn't safe to live in, that account can help you move somewhere else. In Mahuta's case, she didn't need rent withholding. The City issued 13 orders, including many of the fixes she had complained about before. Katz tells the I-Team all of the repairs were made by Jan. 17, weeks before the City's deadline. They said the staff puts every complaint into their computer system and maintenance responds right away. They said some of the work ordered by the City was underway when the inspection happened. They tell the I-Team they follow-up with all projects after they are done. But the fixes came too late to keep Mahuta in the building. She said when her lease is up in June, she's moving out. "I know plenty of people who pay less and their heat works every day, they have electricity, they can take showers," she said. The I-Team exchanged emails with a representative from Katz Properties to learn more about the company's policy. Here is what they said. Q. What is the process Katz has for responding to tenant complaints? A. "All tenant complaints are immediately entered into our computer and responded to promptly by our full-time, professional maintenance staff." Q. How does Katz respond when the City files orders? A. "Most issues are taken care of before any orders are issued. If an order is issued, it is responded to promptly and all work completed before the required completion date. There are no outstanding orders." Q. We have emails from tenants concerned about a lack of working smoke detectors in units and concerns about their water bill due to leaks in the building. While emails may have been returned in 24-48 hours, no action was taken on the issues until the inspectors came to look. Why wasn't action taken before the inspector wrote an order? A. "In fact, work was in progress on this building before inspectors wrote an order. In most cases, work is completed before an inspector visits a property. The onset of cold weather causes our maintenance staff to be extra busy at this time of year." Q. Does Katz do regular checks and/or maintenance on properties for issues? A."Yes. Our building and full-time maintenance staff regularly check on our properties." Q. How are repairs followed-up on when they are done? A. "Repairs are done as quickly as possible by our full-time building maintenance staff and all work orders are followed up on by our office staff to ensure all work is done properly." Q. When maintenance is done, what is the standard expected of that work? A. "Keeping in mind that the property in question is about 100 years old, we still expect a high standard of quality for all repairs and maintenance." "For example, the building in question had two boilers that were custom built for that structure. Unfortunately, when extreme cold struck, the both boilers went out at the same time on a Sunday and we had to special order them. We paid for express delivery of these units, but they had to be assembled at the plant. We did provide space heaters to all the tenants, but since nothing like this happened before, no one could have predicted the impact of the additional load on the building's electrical system (which was never designed to be heated by space heaters). In any case, our staff moved as quickly as possible to restore heat to the building and are on site working with the tenants. Heat was restored within 24 hours." To make sure you are never in a situation like this click this link to learn more about your rights. Learn the City's complaint process here. File a complaint with the City here.